Prostration is a state of extreme physical exhaustion, weakness or collapse. Prostration can be caused by a number of different factors - chemical exposure, illness, physical exertion etc. When one works too hard/long in a hot environment, a potentially life-threatening condition called heat prostration (also called hyperthermia or heat exhaustion) can occur. The condition is marked by nausea, dizziness, and or collapse. Treatment involves rest as well as fluids and electrolytes in severe cases to replace those lost through sweating. Heatstroke is a severe form of heat exhaustion and is a seriously life-threatening condition that requires requires immediate medical attention; see Further Reading below for more information. Prostration may appear on an MSDS as a symptom of chemical exposure, usually through ingestion or inhalation. The victim feels unable to move or think clearly. If someone collapses on the job, seek medical attention. If the collapse is due to inhalation of a substance, remove the victim to fresh air (if possible) and monitor their breathing and pulse until help arrives. Heat Exhaustion and Heatstroke at eMedicine.com - written for the emergency room physician. Heat Exhaustion and Heat Stroke Treatment at WebMD. Heat Exhaustion and Heatstroke at KidsHealth.org. See also: Lethargy, stupor, syncope. 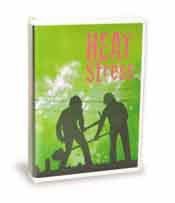 Get your heat stress videos and other safety training materials from Safety Emporium.